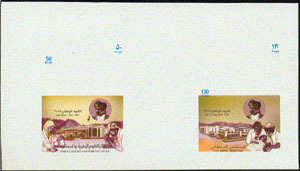 10659 EP OMAN (1987) Marine biology & fisheries research center*. Microscope*. Scientists*. Royal hospital*. Doctor & nurse treating patient*. Compound proof sheet in unissued colors. Scott Nos 304-5, Yvert Nos 297-8. These proofs are from the archives of the Fournier Vittoria Security Printers of Spain. This is a unique item!